How can a headache-inducing mathematical equation have anything to do with a dog rolling around in the mud? For Vet-AI, one of the UK’s hottest new vet-tech start-ups, capturing an eclectic and hilarious range of pet behaviours within the constraints of a mathematical framework is key. We’re overhauling the pet healthcare industry for the benefit of vets, pets and owners by combining pet data with artificial intelligence (AI). We’ve invested the last year creating the infrastructure to learn local and global trends in animal illness and improve veterinary care. Our new app, Joii, which offers veterinary advice and expertise on the go, will be released for Android and iOS in late spring this year. Vet-AI has ambitions to become the leading global powerhouse in animal healthcare and create hundreds of new jobs in the region. We are making this happen through collaborations and strategic partnerships with the region’s best talent including branding consultancy Elmwood, law firm Lupton Fawcett, user-testing consultancy Simple Usability and expert academics at the University of Leeds and Leeds Beckett University. We are also working with the Royal College of Veterinary Surgeons, global medical supplies distributor Henry Schein and are currently in talks with many of the biggest global investors and industry players. With significant cost savings compared to traditional veterinary bills, we predict that in year one we will support over 100,000 pet owners from the comfort of their own home. Joii’s users will have the option of seeking help via built-in symptom-checkers and video consultations with vets. The essential algorithms have been designed by vets, building on their expertise all the way. Collecting data during the first year after launch is what unlocks the real potential of our AI technology. In time, the AI will be trained to identify the statistical trends in our data. The key advantage of this approach is that the AI can begin to function as a decision support system for the vets, summarising and interpreting mountains of pet data in a concise and clinically relevant form. In the longer term, our models will begin to learn deeper and more subtle trends, paving the way for the discovery of new preventative intervention strategies and recommendations. Eventually, we hope this will give rise to new scientific insight for the benefit of the profession. The critical interface between our commercial objectives and the academic expertise needed to develop cutting-edge tech is our new home in Nexus. The innovation centre on the University of Leeds campus is dedicated to connecting business with world-leading research. Every one of our products and service offerings is being built upon a combined foundation of veterinary, technological, mathematical, and commercial expertise. To build a global business, we need the best people. 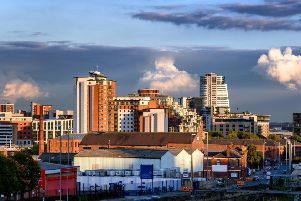 The prosperity and future of young Britons lies in its regional cities and we’re championing Leeds as the place to be.